When I didn’t manage to read a book I had selected for 2017’s Read Harder Challenge I left the library request in as these were books that I had put onto the list for several reasons. Following ElCicco’s detailed and extensive review of A Hope More Powerful than the Sea I knew I needed to read this book in order to bear witness to one woman’s experience as a refugee from the Syrian war as it is one of the greatest humanitarian disasters of my life, and with this being Melissa Fleming’s debut I had an excuse to move it up the list. I am always stunned when I come across people who seem to think refugees are to blame for their circumstances. There seems to be a prevailing response in the United States (and parts of Europe) to blame the individual for the crimes of the masses and government. Perhaps I am so far in the other direction because I grew up in South Florida during the Haitian and Cuban refugee crises of the early 1990s. Dry foot laws and quotas, detention centers, and seemingly racist choices about who to send home to death and who to allow in permeated the nightly news as well as my classrooms and friends’ families were a part of my daily reality and directly impacted my view on what it costs for someone to leave their only home with nothing but the clothes on their back and no guarantee that they will survive the trip. Twenty years later we’re watching it happen again, on a much larger scale. Because the suffering and despair that push refugees to flee their homes and risk their lives can only be tremendous, it is expected that a book memorializing the story of one such woman must be harrowing. 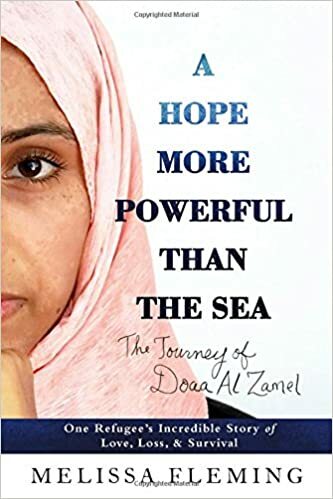 Doaa Al Zamel’s is exactly that, but it is also an incredibly accessible primer on what life was like in part of Syria before the war started, the excitement that the Arab Spring brought, and the realities of suffering that families and communities have been made to endure both in the war zone but also in the places they have run to for safety. Melissa Fleming takes dozens of hours of interviews a well as other primary resources surrounding Doaa’s life and her ordeal in the Mediterranean Sea in order to make the point that not only is this suffering happening, that we are all criminally negligent (my wording) in our overall lack of response and follow through to this humanitarian need. It has become to easy to get caught up in to what the war has metastasized into; and not look into the great crevasse of need it has created. While I wish this story was more directly from Doaa, I understand intuitively why it would have been to hard, to emotionally taxing, for her to have attempted it alone. Instead she turned to Melissa Fleming and the other UNHCR staff and humanitarians to tell her story and to help reunite her remaining family. Doaa’s story is important, and Ms. Fleming has done a respectable job in crafting a streamlined, accessible, and easily read accounting. There is no excuse to not read this book. A Hope More Powerful than the Sea was read and reviewed as part of the charitable Cannonball Read where we read what we want, review it how we see fit (with a few guidelines), and raise money in the name of a fallen friend for the American Cancer Society. 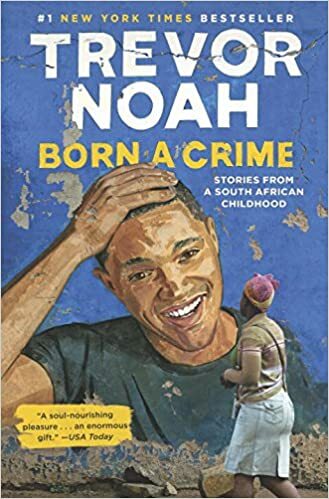 Last year there were several glowing reviews of Trevor Noah’s Born a Crime at Cannonball Read. Based on positive word of mouth I had already picked up the audio version which Noah narrates himself. I was intrigued by Noah – we’re the same age (well, I’m almost exactly a year older) but our lives couldn’t be more different, and I love a good memoir. The documentary hit on some of the same stories he revisited in the book, giving a careful overview of what is was like to grow up in South Africa. In Born a Crime Noah stops being careful and instead explains in detail the realities of his life, the lives of his friends, and his mother. Noah’s mom Patricia plays a large part of his life and it is reflected in the book. I feel as though I know as much about Patricia Noah as I do about Trevor at the end of the book. She is simply amazing. Read this book, go to Netflix and find You Laugh But It’s True so that you can but faces and voices to names and see the world that Noah so lovingly recreates in his writing. The book has some pacing issues, but this is a great memoir and a fascinating look at an interesting life. Sometimes it pays to remember the good ideas cannonballers and friends have so you can steal them outright to suit your purposes. You all should go back and read denesteak’s brilliant review from last January, she unpacks the world through her powerful viewpoint and it is more than worth your time. When I had a few hours to myself on Martin Luther King, Jr. Day here in the States I remembered Dene’s review and the fact that I’m supposed to be finding a single sitting book for the Read Harder Challenge and off to the internet I went. 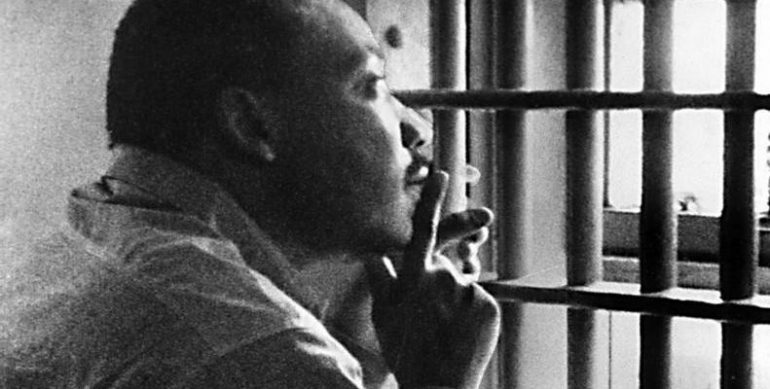 I am ashamed to admit that I had previously never read Dr. King’s full letter. Unfortunately this work is as prescient as it was nearly 55 years ago when Dr. King was imprisoned in the jail in Bombingham. As I mentioned, I intentionally read it all in one go for the Read Harder Challenge and it felt like being hit repeatedly by waves. My favorite thing to do at the beach (besides read under an umbrella) is to jump waves. Sometimes they lift you up, if you time your jump just right you feel as if you are flying. However, if you mistime your jump, or if the wave is too large, you are slammed by the force of nature and sent sputtering towards shore, spitting water as you resurface. What Dr. King was saying in this supremely eloquent letter gave much the same feeling. I was lifted by his resilience, by his steadfast knowledge of the rightness of his actions. I was also slammed back towards shore with how little has really been accomplished. It has been swirling around me for quite a while, all that remains undone and all those who could and should be doing more. Moderate whites (whom Dr. King calls out in some of the most stirring language in the letter) still do not pull their weight. I hope that you will take the time and read the full work. It is tempting to feel as though you know what Dr. King has said because so many famous quotes are pulled from this piece of writing. But Dr. King was a titan of oratory and this letter builds and builds and builds to a crescendo of meaning, and as Dene points out, supreme amounts of shade. 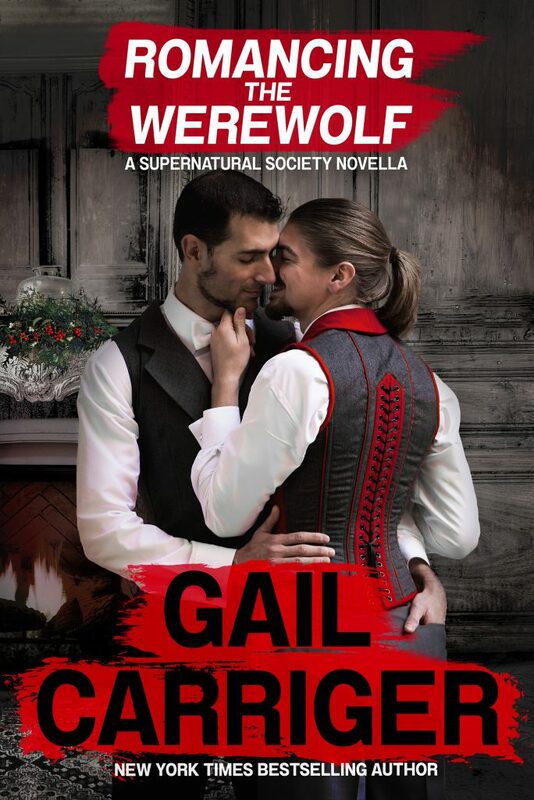 This book was read and reviewed as part of the charitable Cannonball Read where we read what we want, review it how we see fit (within a few guidelines), and raise money for the American Cancer Society in the name of a fallen friend. Join us, won’t you? After not completing last year’s Book Riot Read Harder Challenge I am back at it again for 2018 with a new set of challenges. My first stop was seeing if any of the books I did not manage in 2017 would suit a 2018 challenge, and low and behold the book I had picked out for last year’s task 8: Read a Travel Memoir would suit this year’s task 4: Read a Comic Written and Drawn by the Same Person. A couple of years ago I read and enjoyed Relish and was looking forward to another visit with Lucy Knisley. An Age of License chronicles approximately a month of Knisley’s life in the fall of 2011 when she cobbled together a few segments of travel to allow herself time to roam around Europe (specifically Norway, Sweden, Germany, and France). It is also a look at a woman in her mid-twenties flailing about a bit, if you’ll forgive the less than complementary descriptor. Knisley through her own eyes is finding her footing professionally, mourning the end of a relationship, settling herself into a new city, and taking off to see a bit of the world and a boy she met. We join her as she files away a variety of new peple, new experiences, and ruminates on how to settle into her adulthood. My experience with Knisley’s art is rather limited, but one of the issues I had with Relish was that the panels were so tightly drawn, with so much happening in each panel. In An Age of License Knisley spreads out a bit, using the white space to help foster the feeling of floating in the ether that she is experiencing in her month of travel. I prefer this visual style, but the narrative is thinner than I would have hoped. A good, quick read, but not too much more. I start all of my review drafts with the Cannonball Read number because that used to be how we formatted our titles way back in Cannonball Read Four. So, Holy motherforking shirtballs everyone, I just typed CBR10 for the first time as relates to a review. Let’s do this! This is a lot of preamble to get to the point: if you like YA at all and haven’t read this book you should rectify that pretty quickly. Jandy Nelson has a way with world building and character development that insidiously sinks into you. During the first half of the novel I was thinking it was quite good and I would probably end up rating it 3.5-4 stars and have some really nice things to say about the characters and the plot, and the easy but satisfying mystery of the missing in-between years (our narrators trade off from either side of a two year gap where we know what happened, but we don’t know what really happened). Then, somewhere around page 200 I fell ecstatically in love with the characters, their ways of expressing themselves, the realness of their lived experience, and the sorrows they carried with them, both before and after the big tragedies. Jandy Nelson describes her work as a story about artistic passion and pleasure, about the ecstatic impulse, and about split-aparts. It is also a work about self, and being firmly in this life, and also not. Its about solving big puzzles and putting the pieces back together. For me, it is also a fantastic look at family, siblings, and grief and what you use to pull yourself out of the darkness and find your authentic voice. May we all be like Grandma Sweetwine: have our own bible of wisdom we have gathered and a relationship with the universe so personal that we feel comfortable calling god Clark Gable. Make a wish, take a chance, remake the world. This book was read and reviewed as part of the charitable Cannonball Read, now in our 10th year. At Cannonball Read we read what we want, review it how we see fit (with a few guidelines), and raise money in the name of a fallen friend for the American Cancer Society. You can join us, registration is open through January.